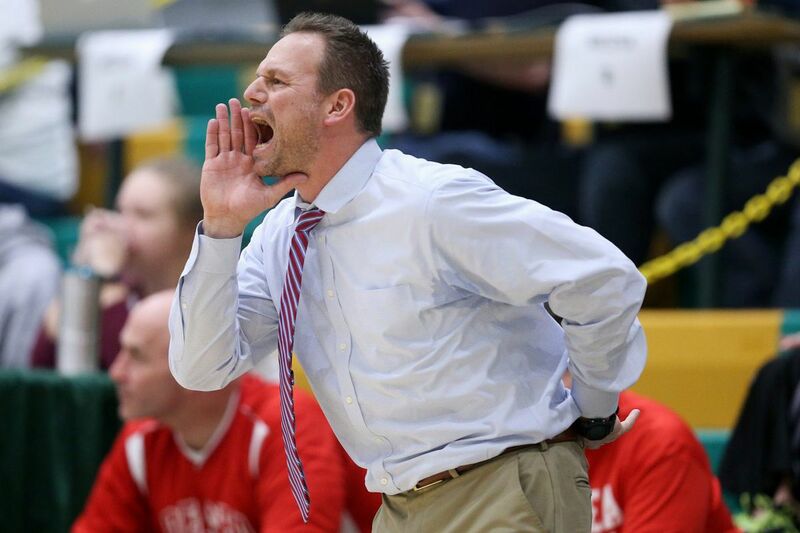 Delsea head coach Tom Freeman shouts from the sideline during the NJSIAA South Jersey Group 3 championship game against Seneca at Seneca High School in Tabernacle, N.J., on Tuesday, March 6, 2018. Delsea won 53-40. It was nearly one of the greatest comebacks in recent South Jersey basketball history. Delsea stormed back from a 25-point deficit in the third quarter, cutting Nottingham's lead to 72-70 with a little more than a minute to play in the Group 3 state semifinals at Brick Memorial High School. But Nottingham, the Central Jersey champion, pulled away for a 77-70 victory to advance to Sunday's state championship game at Rutgers University. "It all showed tonight," Delsea coach Tom Freeman said. "The toughness, the grit, the heart, the character of these kids, it all showed in a loss." Junior guard Javon Gordon, who registered his 1,000 career point, led Delsea with 16 points, while junior guard Kobey Evans bounced off the bench to score 13, including eight in the fourth quarter. Senior guard Nate Cox also was a key to the Crusaders comeback, with six points in the fourth quarter. "We didn't quit," Freeman said. "We almost did it." Delsea (25-6) fell behind 39-22 at halftime as Nottingham (28-2) scored four points in the final three seconds of the second quarter. "I think we were a little uncomfortable at first," Freeman said. "We're from a little town like Franklinville, and this was a big game, state semifinals." Nottingham, which beat Moorestown in overtime to win the Central Jersey title, stretched its lead to 55-30 on a bucket by Kostro Montino midway in the third quarter. From there, Delsea outscored Nottingham 40-17 in a furious rush of defensive pressure to pull within 72-70 on Kolby Braxton's two free throws with one minute, 11 seconds remaining. But Nottingham got a basket from Cliff Joseph, Delsea missed a three-point attempt, and the Central Jersey champions sealed the win with three free throws in the final 38 seconds. "These kids have given me the best 120 days of my basketball life," Freeman said of his players. "You wish it could go on forever. We said that in January, we wished we could play 40 more games. "But it always has to end." D: Nate Cox 11, Javon Gordon 16, Kolby Braxton 9, Aziz Saud 8, Will Hawkins 9, Kobey Evans 13. N: Kostro Montino 20, Kylane Johnson 4, Richie Jones 18, Darnell Johnson 16, Cliff Joseph 17, Deonte West 2.